Hauling all your belongings to and from an area outdoors takes lots of preparation and work. You must ensure that all items are packing accordingly, tools in possession, and clothing attire is appropriate. 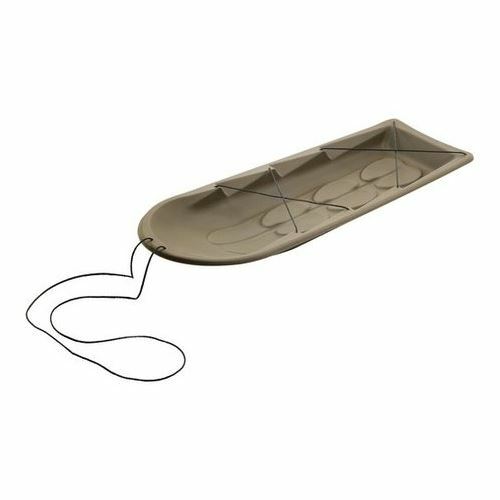 If you need to take such things with you or simply need something that will keep your game or fish clean and free of debris, a deer sled is one of the best products for achieving this. Most are made from polyethylene, a dense plastic that’s scratch resistant and able to withstand a large amount of pressure and weight without breaking. There are lots of other uses for the sled that could take place in your yard as well, so be sure to look at the buyer’s section when you’re done with the reviews. The comparison chart below shows that most of the sleds have a lot in common, but there are some distinct contrasts, especially in the colors and rope placement. Use it for a quick reference point to go back to in case you need a brief reminder on what you’re getting in the box. 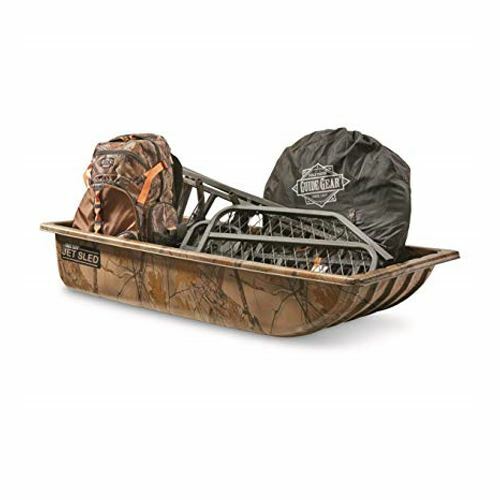 The Beavertail Sport Sled is beige in color and comes in three sizes. If you’re planning on pulling a lot of items on the sled, you’ll want to stick to the larger version. But you could get away with the smaller sleds, especially if your primary use will be pulling simple catches such as fish or small birds. It also goes smoothly over rocks and snow, so take it with you for any hunting or fishing trip to keep your items in one place that you won’t get wet (until it’s time to trade it for your prize). 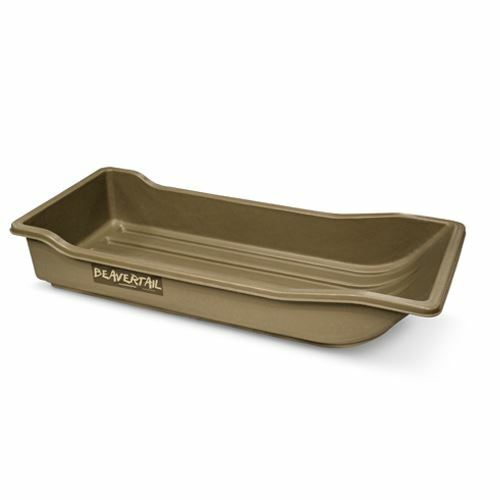 You can bring it over the water too, so if you intend to use for deer or elk, there won’t be a problem pulling it over a small stretch to keep them from getting wet. With large animals in mind, it’s built to withstand heavy weights and will not tip over. You might need to get handles to go with that rope to make it easier on your hands, but overall there are mostly good things to be had with the Beavertail Sled. Recommended for everyone needing mobile storage that’ll keep anything inside from getting dirty. Capable of hauling medium-sized elks and other heavy gear with no fatigue. Uncomfortable to grip unless modifications are made to the handle. The Shappell Jet Sled 1 is another great option that’s painted over a nice woodland camo. It blends well during the fall but travels so well, you may find yourself doing yard work such as hauling firewood and tools outside your residence. If the rope is not adequate for what you’re intending to pull, just replace with 550 cord so the area that meets the rope will hold up longer without needing an early replacement. Regardless, the rope it comes with is fine if you wish to stay with what’s available, however. 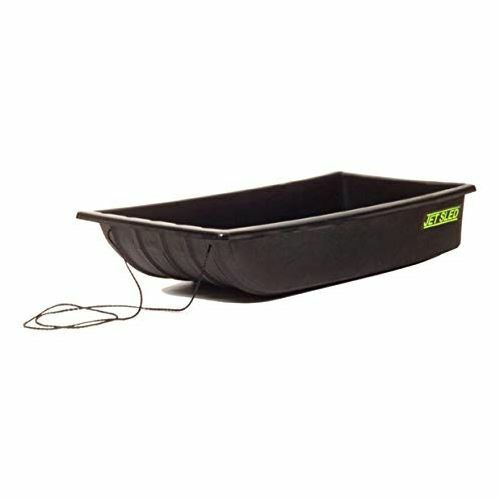 If you need something that floats, you should be able to manage with this sled. Just make double sure that you’re not overloading anything. There are plastic holes found on the front housing that make it easy to customize the sled.The Shappell is a good sledding vehicle over very rough terrain, so use it when you know rocks and other hard surfaces are likely for you to come into contact with as you tow. Scratch resistant bottom and surface can be dragged over rough terrain and remain in good condition. Although it floats, does not remain stable enough to keep weighted materials from getting wet (must be balanced). At first glance, the Terrain Deer Drag Sled looks wider and a bit shallower than the other sleds shown. But can hold about the same capacity as the larger versions of what was reviewed. It’s a light brown colored product that’s advised for people who need to pull something that won’t fall out of the center during transport. The rope that’s included forms a shoelace-like tie, going through 10 holes in total. As you pull at the sled during movement, the rope becomes tighter over your load. It’s a good feature to have when moving along inclines and other uneven surfaces. Any type of product, when hit with something that’s jagged or very dense, could break if the forces become too much for the material to bear. You will need to use caution as you drag it over hard objects. It’s not invincible and could break when the load is very heavy and bangs against something equally tough. And the rope may cause the edges to bend slightly under the same amount of stress, potentially tipping the entire sled over. A workaround is to spread the weight out as evenly as possible when you’re on the ground. Don’t concentrate the mass in the center. Still, the Terrain Deer Drag Sled remains a good choice for anyone items that come out easily from other sleds when moved. Does not warp or crack when sled down an incline. Plastic is thin and may break at the bottom if hit by a hard object. The Shappell Jet Sled might look rudimentary in appearance but carries the same standards as the others shown. It’s black, so if you tend to buy items in a darker color, it will look well when paired with any equipment. Floatation works very well here, with a lower base that’s capable of carrying a person over a shallow body of water without sinking. Those in possession of an all-terrain vehicle will are also in luck. Just tie it down in the back and use the sled as a makeshift tow. The polyethylene plastic is strong with this one, so nothing should break, even if moved over dense ice or other solid materials at a respectable speed. But you might need to change the rope’s housing. You could drill holes in the side to crosslink, but under regular use that doesn’t demand to pull anything that’s excessively heavy, the Jet Sled will work fine with its default setup. Pulls over bumpy ice without becoming stuck. The thin rope digs into the hands when being pulled. The Dead Sled is the final product featured. While the name is amusing, the features found here shouldn’t go unnoticed. It’s a little different from the others, having no side portions that separate objects from the ground. It’s a lot thinner than what you may have used before. So if you don’t want to break it early in its travel, you must keep the loads moderate at best. If it gets too heavy, the tips could warp and break, particularly if you’re not paying attention to the ground being traversed over during the pull. And it’s advised that you get a better rope than what given here; the risk of it breaking are high. Your game or gear is tied with straps placed on the tips, which are tightened to keep anything from rolling off. The lightweight build will be felt as you travel with it, making the sled a good tool when moving over long distances. Additionally, since there isn’t a real cutoff point along the edges that divides the inside from the ground, you could end up with dirt or ice (in the snow) in the front when hauled. In short, this sled is a good buy but may break if used in terrain that’s a little too rough. Moderate your pulling and be careful to not walk in areas that are thick in the mud. There’s shouldn’t be too many issues so long as you take your time. At medium weight, does an effective job at traveling over long distances. In icy/muddy conditions, debris may accumulate on the left and right corners of the sled, getting items dirty and wet in the front. Check out the tips below to help you find the right sled for your next outdoor event. When you’re finished reading, you should have an idea on what you looking for, and the product(s) that come closest to what you have in mind. Pulling a sled might seem like something that you wouldn’t need to give any thought over, but you must remember that you’re probably going to be hauling weight that’s considerably larger than your own body mass. Before even attempting to find a sled, understand that it’s a manual job. Pulling is required, which means you’ll either have no problem doing it, need frequent breaks in between hauling, or are unable to use a sled at all. There are no automatic features here. Yet, since you are here, you’re probably already aware of this demand. An empty sled is probably the easiest object you’ll carry around but can become a little more difficult depending on what you hauling. 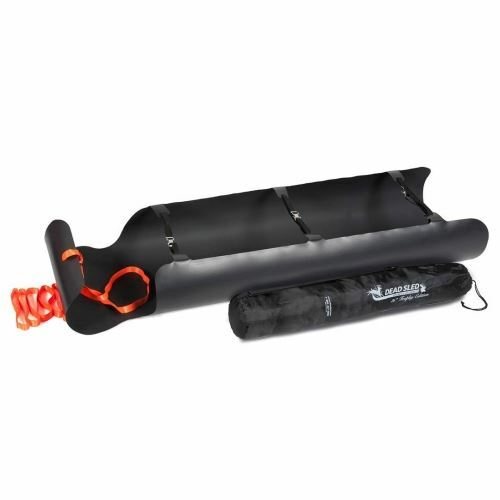 Most deer sleds can withstand weights in the hundreds of pounds range or higher, so capacity isn’t an issue, so long as you consider the terrain your pulling in. This means regions with steep inclines, hills ravines, and knolls will necessitate better planning on what items you plan on carrying in the sled itself. Look for versions that are ideal to move up slopes of various sizes but won’t break the rope or break underneath the part that touches the ground. As shown in the last section, some sleds perform better in different types of geography. For example, a sled that doesn’t have sides but has a long shape may break apart when traveling over rocks, but have no trouble carving through ice or snow. Look at the materials used in its construction, then find out if there’s anything you mind need to do in order to make the sled better. Some users even drill more holes or add handlebars to the ropes to make it easier on the arms when pulling. Although not always the case, speed could be another concern. Deer sleds are much faster you operate when they are built in a way that requires few adjustments when it’s being pulled. The more stops you have to make during your hiking, sledding, or float, the quicker you can get whatever is inside to the destination you are heading to. Find one that you know won’t bog you down from faulty construction or tip-overs. Did you know that most deer sleds can float? Obviously, this doesn’t describe all of them, and under no circumstances should one be paddled over a deep river or other bodies of water that’s deeper than a creek or pond. But when packed carefully, they can tow items across shallow waters and keep your catch or belongings clean and mud free. Some are even buoyant enough to carry you if needed. If you do intend to use the sled for this, bring a paddle with you and be careful to balance the weight distribution at the bottom portion. That way nothing will tip over and sink. Deer sleds can also be used for recreation or simply yard work around the home. Many families buy them to pull their children in when winter starts and the snowfall begins. Speaking of winter, taking your sled on the water during ice fishing is a great way to tow your auger or tools needed for such an event. Most of them are big enough to withstand the weight of multiple pieces of firewood. The smooth surfaces below make it quite painless to move to a different located when the distance is short. After you have chosen the deer sled you want, compare it to the top two on the list. In case you skipped that part, they were the Beavertail Sport and Shappell Jet Sleds. They can be customized or used entirely on their own and remain solid transport devices that help carry around your outdoor belongings. 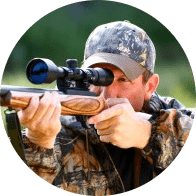 But if you fancy the other three, you’ll be happy to know that it’s definitely not a race to the bottom, whereby each sled will get you through a successful hunt or task without a headache.